Ruth Fertel was the founder of Ruth's Chris, one of the most successful franchise restaurants ever. The story of her life is mesmerizing. Born and raised in a Plaquemines Parish river town, she was a memorable Louisiana character. Here is one of her favorite recipes. Yes, it's what you think it is. 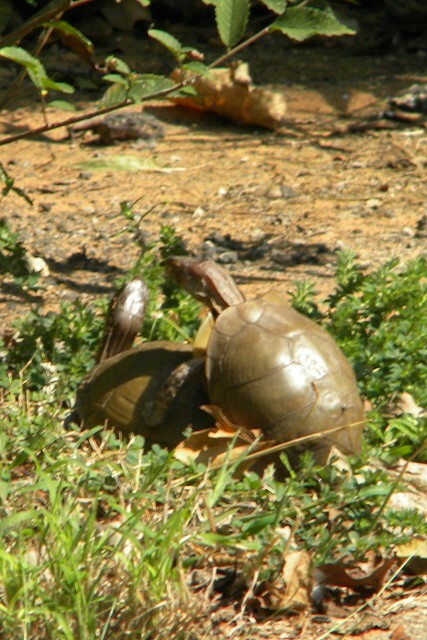 About a month ago, I noticed these turtles outside my office, going at it in broad daylight. For shame! 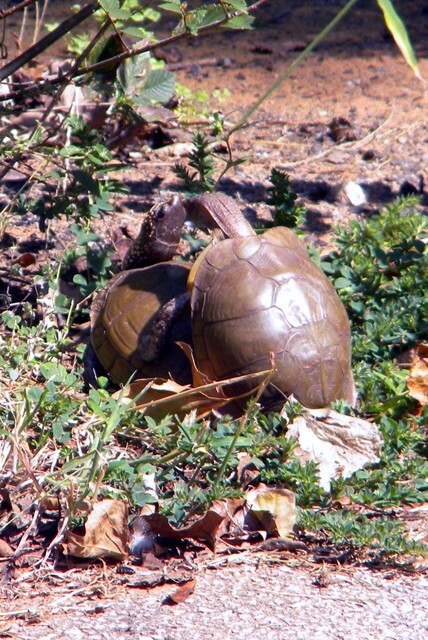 Does wildlife have no decency? Oh well! 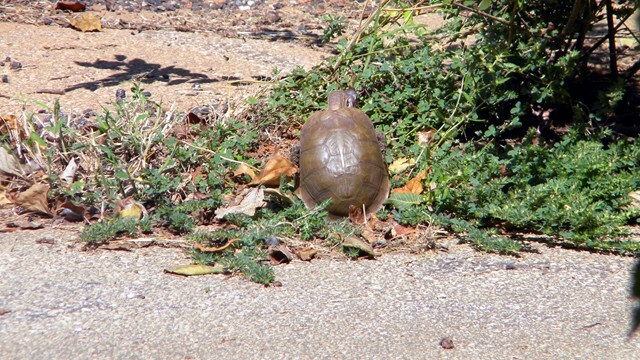 Maybe there will be a bunch of new baby turtles come spring. When she was much younger, Marilyn worked as a waitress at a restaurant on the pier in Long Beach, California. The chef could cook like no other, and he also had a temper. Once, when someone sent a steak back to the kitchen for the second time because they didn't think it was done enough, he tossed it in hot oil and deep fried it before sending it back to the person that had complained. Another time, when Marilyn walked into the kitchen when he was in an unexpected snit, he threw a butcher's knife that stuck in the wall by her head. Though the chef was a bit sensitive (to say the least!) she learned his secret for cooking prime rib to perfection. 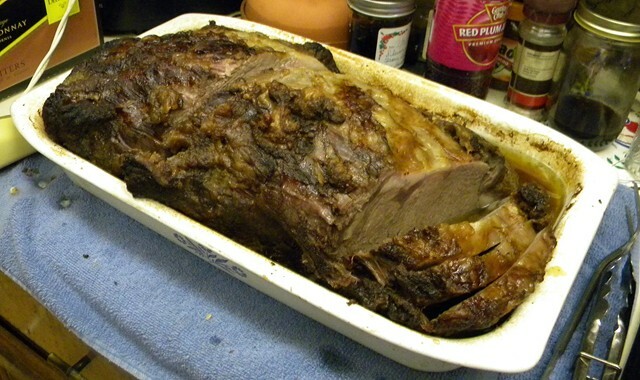 Here is a pic of the one Marilyn cooked us for Christmas. Ate too much! Drank too much! Too much fun! Merry Christmas everyone! Ancient Mayans seemed to think the world would end on December 21, 2012. Though accomplished astronomers, the Mayans missed on their prediction. Perhaps a slight adjustment in the universe occurred. We’ll likely never know. A similar civilization existed in the Midwestern part of the United States, from settlements near the Great Lakes to the Gulf of Mexico. These early Americans built large villages along the main rivers beginning around 800 A.D. The Spiro Mounds in eastern Oklahoma is one of these settlements. Thousands of artifacts, including intricately engraved seashells, have been collected from Spiro. Anthropologists call the early Americans that populated the settlement Mississippians. 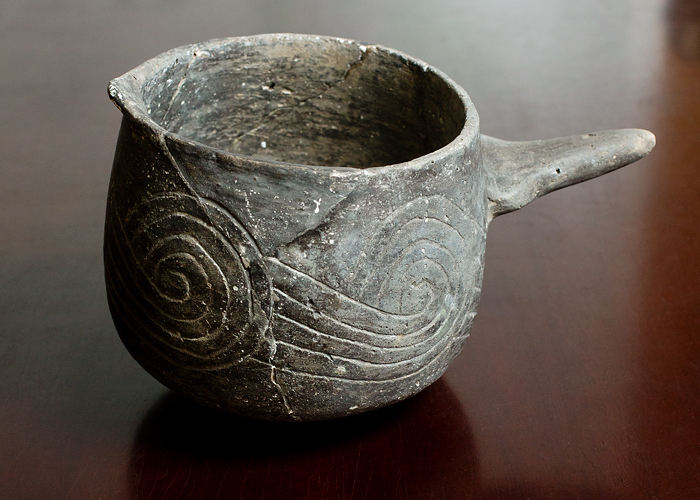 One of the artifacts found at Spiro, and at other Mississippian settlements, is the black cup. During rituals, Mississippians would drink strong, highly caffeinated teas from the black cup until they vomited, ridding their bodies of evil and facilitating the ability to predict the future. 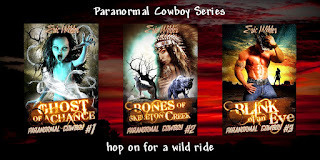 In my paranormal mystery novel Bones of Skeleton Creek, gumshoe Buck McDivit meets Esme, a mystic healer, and possibly the last Mississippian. With her help, he takes a dream walk and visits the Great Spirit. They puff a cloud blower and drink from the black cup until Buck gains insight into the mystery he is trying to solve. Today is December 21, 2012. The world hasn’t ended, at least yet. It doesn’t mean the ancient Mayans, Incas, and Mississippians didn’t have considerable knowledge about the world as we know it. It simply means the asteroids, or whatever celestial objects were supposed to collide with our planet became somehow shunted by a millisecond or so. Many of the heavenly secrets discovered by the ancients are lost forever. And then again, maybe not. I'm going to fire up my own cloud blower and slug a few shots of strong coffee from my black cup. Maybe by tomorrow, I'll make a few predictions of my own. Born near Black Bayou in the little Louisiana town of Vivian, Eric Wilder grew up listening to his grandmother’s tales of politics, corruption, and ghosts that haunt the night. He now lives in Oklahoma where he continues to pen mysteries and short stories with a southern accent. 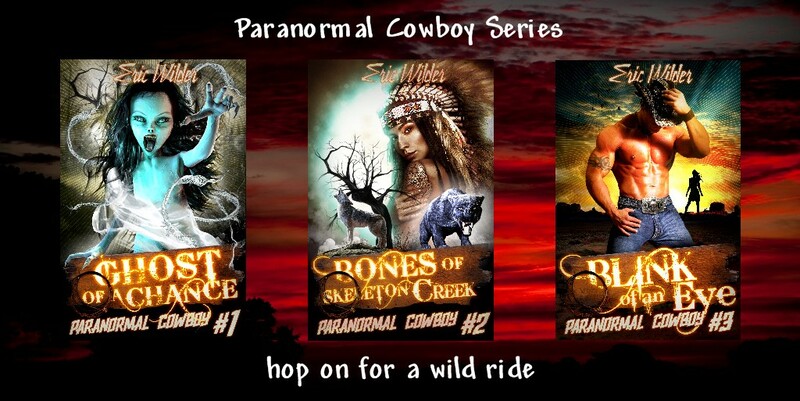 He is the author of the French Quarter Mystery Series set in New Orleans and the Paranormal Cowboy Series. Please check it out on his Amazon, Barnes & Noble, and iBook author pages. You might also like to check out his website. 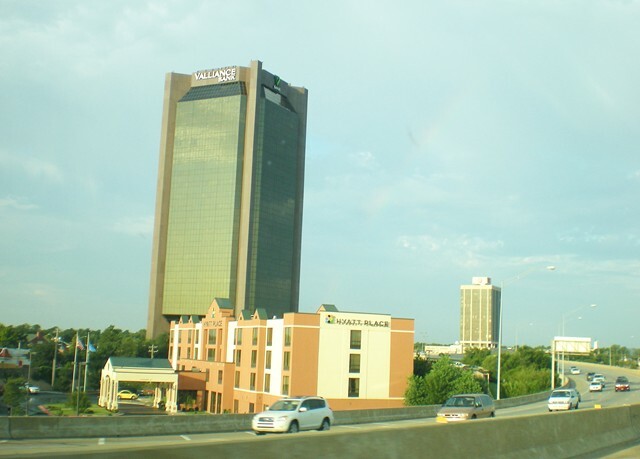 Here is a pic of the Penn Square Tower in Oklahoma City, built toward the end of the 80s oil boom, and a symbol of what brought the industry down. 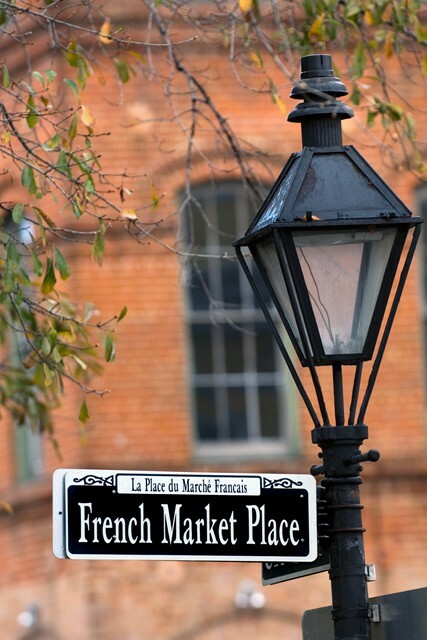 I visited New Orleans for the first time in the fifties. My Aunt Carmol was a school teacher and gave brother Jack and me daily guided tours of the city while we were there. Aunt Carmol was also a wonderful cook, and especially liked preparing and serving authentic Creole dishes. Jack and I loved Aunt Carmol’s Southern Tomato Soup. Try it. I’ll bet you will too. Cook tomatoes in three pints of water for 10 minutes. Drain and save the water. Press tomatoes through a sieve. Add cucumber, onion, okra, hambone, and the saved water to the tomatoes. Simmer for 3 hours. Combine flour with cold water to form a paste. Add to soup before serving, along with salt, cayenne, and butter. I graduated college many years ago. 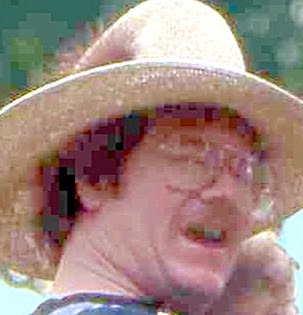 The school, at the time, was Northeast Louisiana State College. My first three years there, the football team never won a single game. My senior year, they tied a game. This year, my alma mater, now ULM was wonderful in football. The quarterback is phenomenal. While I was at NLSU, we were in the Gulf South Conference, along with Louisiana Tech. Some of you might remember. That's where Terry Bradshaw played ball in college. Louisiana Tech was 30 miles away in Ruston. My four years at Northeast Louisiana there was a rivalry like no other. My business partner graduated from La. Tech. Now, they've rejected an offer to play ULM in the Independence Bowl In Shreveport, LA. I'm blown away! I guess old memories never die. Louisiana Tech is afraid to play ULM in a bowl because they have so many bad memories of having their asses kicked, so many times. If you are afraid to play ULM, then just say so. I can recognize a coward when I see one.